An elegant and delicious Cherry Crumb Cake that is sure to receive rave reviews at your next potluck or barbecue. Crowned with juicy ruby red cherries and a ginger-lime topping with crunchy pecans this crumb cake not only makes an impressive treat but you’ll also find it really simple to put together. Having a neighboring outdoor farmer’s market that’s opened 24 hours a day certainly has its perks, especially coming off work after a late evening shift. This farmer’s market is in the heart of a bustling metropolis with great produce at extremely affordable prices but only opened during the Spring to Fall seasons. With a large student population nearby from Université de Montréal and staff from local health institutions as well as the many tourists trekking down from the stunning Saint Joseph’s Oratory perched high up on Mount-Royal, this is the place we are all drawn to. 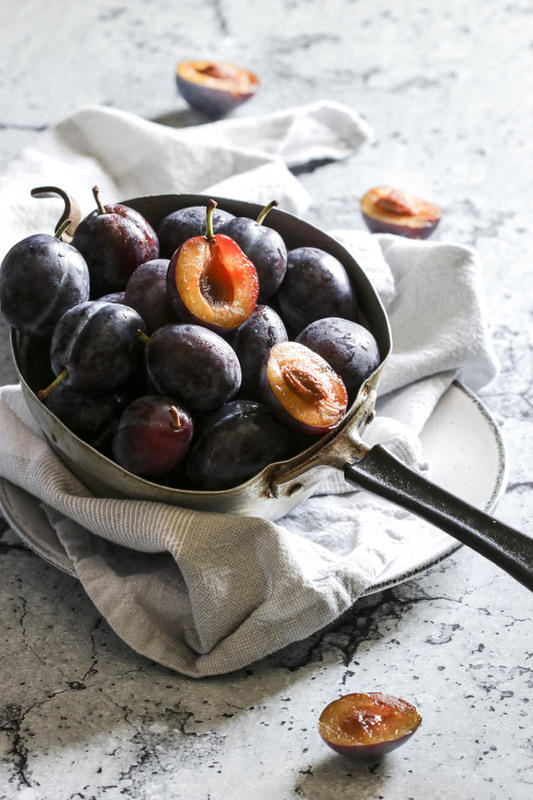 And now with cherry season upon us and outdoor stands brimming with one of summer’s luscious fruits, who can resist the pull to purchase this delectable fruit! 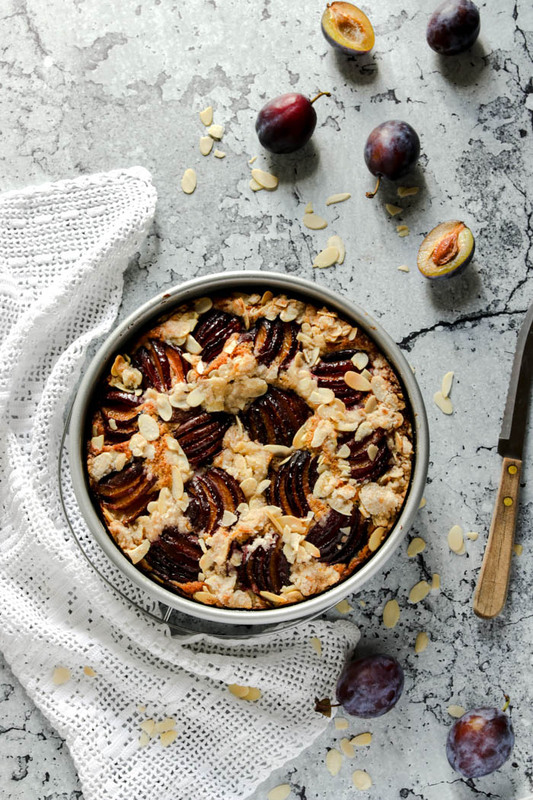 Although I’d be just as content savoring every bite while basking in the warmth of a beautiful sunny day, transforming them into a special baked treat is definitely the cherry on the cake! 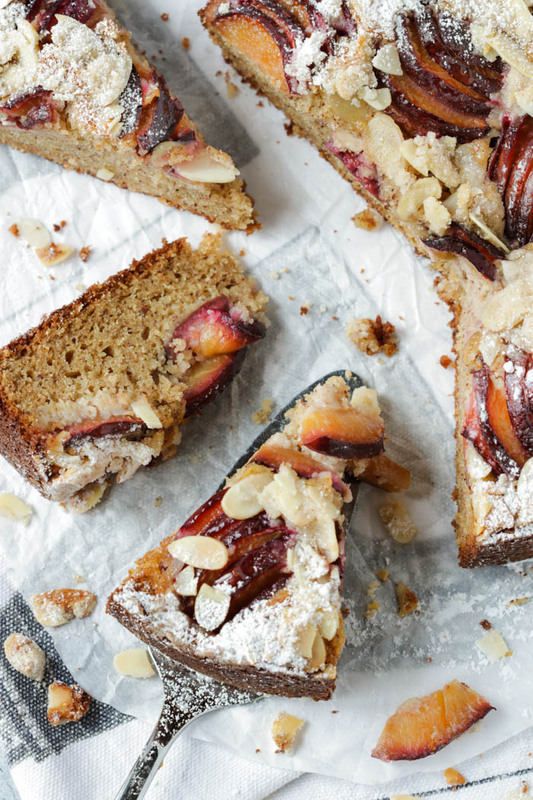 While the cake is soft and dense in texture you’ll find that there’s a lovely contrast from the sweet burst of cherries just beneath the crumbly layer of ginger-lime and pecan topping. As a result you’ll get some sweet goodness in every bite. 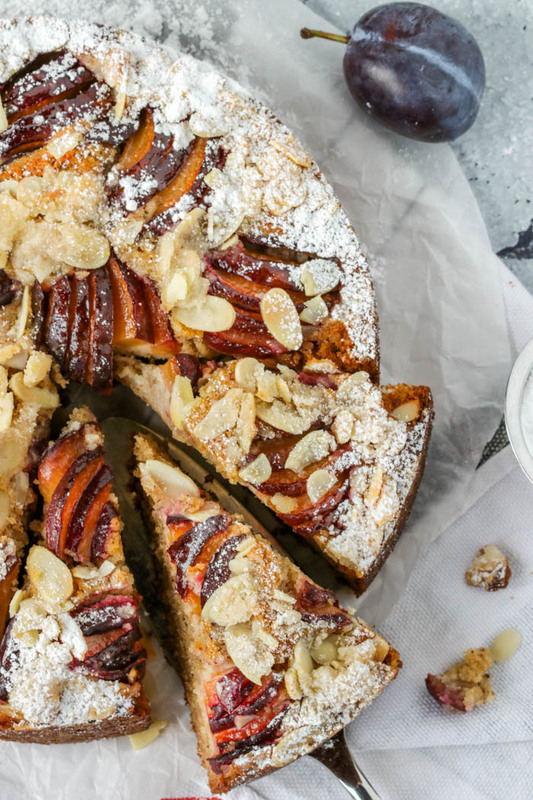 Also scented with pure almond extract which adds a perfect balance of sweet and nutty flavors while enhancing the taste of this yummy cherry cake. Maybe you prefer to eat some cherries simply as they are while wondering how else to enjoy this “best of summer” fruit. However, you’ll most certainly want to try this Cherry Crumb Cake…especially before the cherry season winds down! An elegant and delicious Cherry Crumb Cake that is sure to receive rave reviews at your next potluck or barbecue. Crowned with juicy ruby red cherries and a ginger-lime topping with crunchy pecans this crumb cake not only makes an impressive treat but also, you'll find it really simple to put together. First lets combine all ingredients for the ginger-lime crumb topping in a small bowl and stir until the mixture is crumbly. The mixture can be made ahead and stored in the fridge for up to 5 days. Grease and flour an 8 inch springform pan then line the pan with parchment paper and grease the parchment paper. In a large bowl, beat the butter and sugars together on medium speed until fluffy. About 3 to 4 minutes. If using a stand mixer make sure to occasionally stop and scrape the sides of the bowl. Spread the pitted cherries evenly over the cake batter. Sprinkle the ginger-lime crumb topping over the cherries. Bake the cake for about 1 hour or until a wooden skewer inserted in the middle comes out clean. The cake can be covered and stored at room temperature for up to 2 days or refrigerated for up to 6 days. Delicious flavors of the ever popular Italian ice-cream better known as simply Spumoni, is revisited in a three layered spectacular Italian Spumoni Cake that is sure to impress. Crumbly cake layers of strawberry, chocolate and pistachio are stacked together while separated by strawberry preserves and pistachio cream. 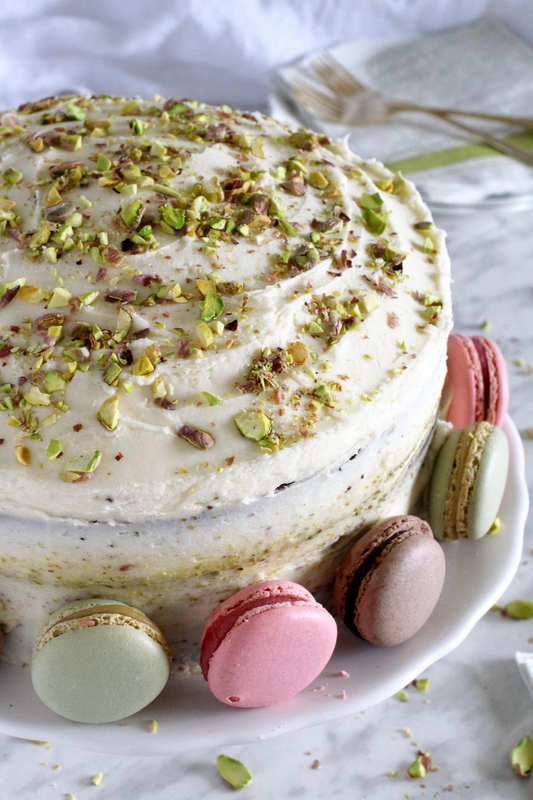 Frosted with a vanilla scented buttercream, sprinkled with some crushed pistachios and then decorated with spumoni flavored french macarons for a truly celebratory dessert. Every once in a while hubby will surprise me with the latest Bake From Scratch Magazine, packed full of drool worthy baked goods that can easily be replicated at home. A true baker’s delight in every sense of the word. This latest issue has some of the loveliest naked cakes or rather nearly naked cake recipes and the one that caught my eye was the Spumoni Cake. I love it for its pretty trifecta of colors which takes me back to those lazy hot summer days, happily sitting outside while enjoying some yummy spumoni ice-cream. Although I’m not a baker by profession and have only ever baked a few layered cakes in my lifetime, I found this cake not difficult at all to put together and I’m sure you will too. While you’ll basically be baking three separate layers, it’s really one cake batter divided among three separate bowls. One bowl will have strawberry preserves folded into the batter, the second bowl will have cocoa mixture folded in while the third bowl gets some delicious pistachio paste. You’ll want to begin assembling the cake directly on its serving platter lined with 2 pieces of parchment paper joined at the center. You then simply pull out the 2 sections when you’re done frosting for easy clean up. Since decorating this beautiful Italian Spumoni Cake is where the fun really begins, do know that you can truly use your imagination here so feel free to add your special touch. Although, the original recipe called for freeze dried strawberries to garnish the cake, they were really hard to find and I had absolutely no luck in finding them. However, I did come across some adorable french macarons looking simply perfect and I new they would adorn this cake quite beautifully. I used a little dab of buttercream on one side of the macaron so that they adhered to the cake and I must say they added such a lovely touch to the overall look! Who would not want to sink their teeth into a slice of this delicious goodness…right? Actually, hubby and I did just that! Day after day and just until there was not a crumb left. But please don’t judge, you would have done the exact same thing, I’m sure of it! Worth mentioning here is how this cake actually tastes better the following days. Partially due to the preserves and pistachio paste nestled between the layers which keeps the cake very moist and also enhances the flavors of this visually stunning cake. As a result, this cake is an excellent make ahead dessert for those busy and extremely chaotic occasions which we all have from time to time. Pistachio cream can also be made ahead and kept in an airtight container at room temperature for up to 1 week. You can therefore really pace yourself by making a few steps ahead of time which is always a win win in my book. All the flavors of the ever popular Italian ice-cream better known as simply Spumoni, is revisited in a three layered spectacular Italian Spumoni Cake that is sure to impress. Grease and flour 3 (9 inch ) round cake pans. In a large bowl, beat butter and sugar together at medium speed just until fluffy. This should take about 3 to 4 minutes and if your using a stand mixer, you'll want to stop and scrape the sides of the bowl a few times. In a separate medium sized bowl, whisk together the cake flour, 1/4 cup all purpose flour, baking powder and salt. With your mixer on low speed, gradually add the flour mixture to the butter mixture alternating with the milk while starting with the flour mixture and ending with the flour mixture. Beat just until combined between each addition. Divide the batter evenly among 3 separate bowls. In the first bowl, fold in a 1/2 cup of well stirred strawberry preserves and the remaining 1/4 cup all-purpose flour. Combine the cocoa, 1/4 cup of boiling water and baking soda in a small bowl. Fold the cocoa mixture into the second bowl of cake mixture. In the third bowl of cake mixture, fold in a 1/2 cup of pistachio paste. Spoon the cake batters into the prepared pans and smooth the tops with an offset spatula. Test to see if its done by inserting a wooden skewer in the center of the cake. If it comes out clean then the cakes are ready. Allow the cakes to cool in the pan for 10 minutes then invert onto a wire rack to cool completely. Place the strawberry cake layer onto your serving platter and pipe a ring of vanilla buttercream all around the inside edge of the strawberry cake layer, creating a border. Spread the remaining 1/2 cup strawberry preserves over the strawberry cake layer making sure to stay between borders. Carefully place the chocolate cake layer over the strawberry layer and pipe a ring of vanilla buttercream around the inside edge, creating a border. In a small bowl stir very well together 1/2 cup of the vanilla buttercream with the remaining pistachio paste and spread this over the chocolate layered cake while staying within the border. 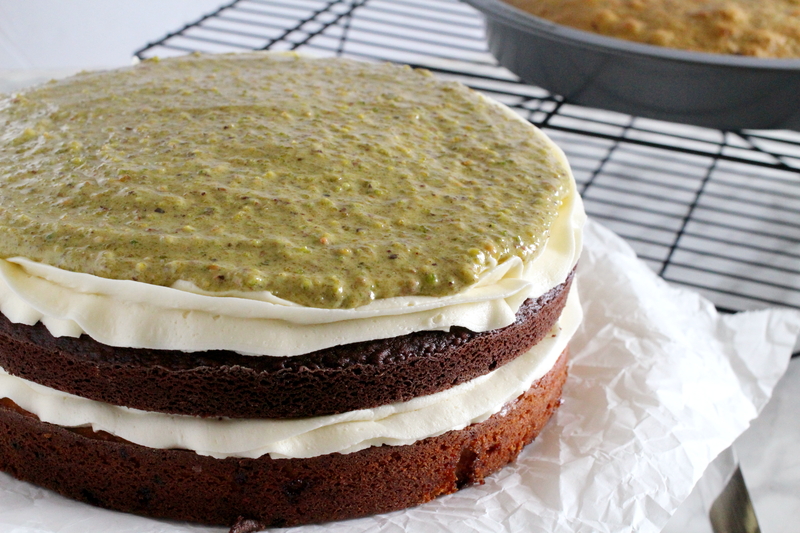 Carefully top the pistachio cake layer over the chocolate cake layer. Garnish with chopped pistachios and chocolate, strawberry, pistachio macaron cookies if desired. Grind pistachios as fine as you can using a food processor or better yet a spice grinder if you have one. 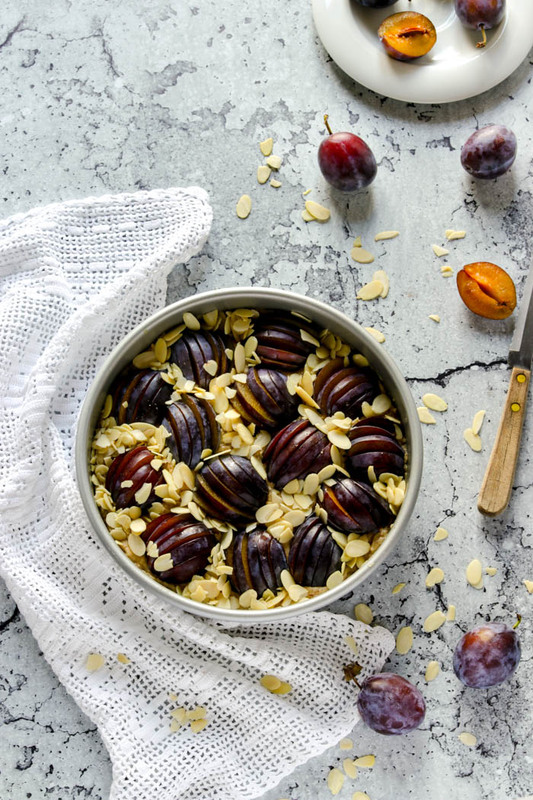 Stir together the grind pistachios and honey in a small bowl. Stir in 1/4 cup of water, 1 tablespoon at a time, until the paste has a consistency of peanut butter. Pistachio paste can be made ahead and stored in an air tight container at room temperature up to one week. Place the butter in a large bowl and beat at medium speed just until creamy. Beat in the vanilla and the salt. Reduce the speed to low and slowly add the confectioners sugar. Increase the speed to medium and continue beating until smooth. Beat in the milk one tablespoon at a time until the buttercream frosting reaches a spreadable consistency. Recipe is adapted from Bake From Scratch Magazine. 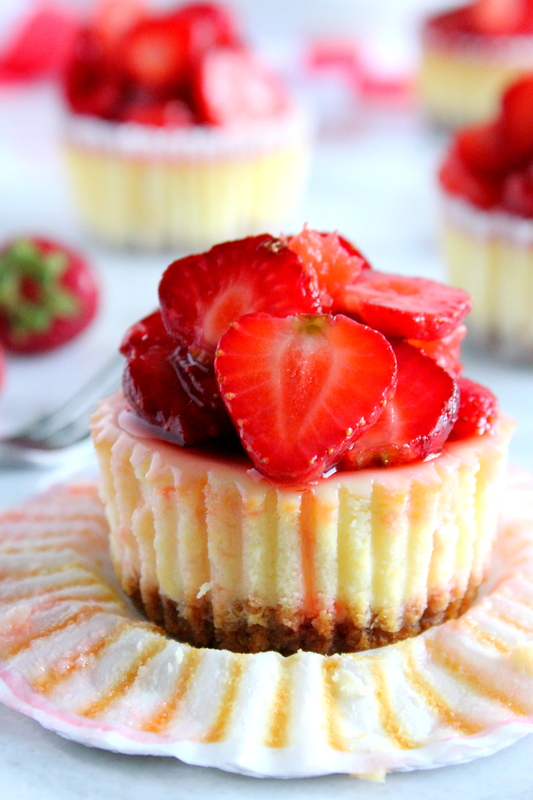 These mini strawberry and grapefruit cheesecakes, showcases one of Quebec’s more delectable fruits. They are wonderfully sweet and pair perfectly with the juicy pink grapefruit segments. Both fruits are macerated together and then nestled atop the mini cheesecakes to provide a truly refreshing and stunning appearance. You will love the ease with which this recipe comes together. It is fairly simple to prepare and the cheesecakes can be baked ahead of time! As an added bonus, they are sure to impress! Once baked the mini cheesecakes need to be properly chilled for at least 4 hours, so do plan ahead. If using the more delicate sweet strawberries I would not recommend preparing the fruit ahead of time as it renders the strawberries with a lackluster appearance. For ultimate freshness, I prepared my fruit mixture just before serving. With the red and white colors of the Canadian flag, these mini strawberry grapefruit cheesecakes make a delicious celebratory dessert for Canada Day or just about anytime one is craving a sweet little morsel! Have a safe and fun filled Canada day everyone! Place paper liners in 12 cup muffin tin. For the crust, combine the graham crackers, 1 tablespoon of sugar and 2 tablespoons of melted butter in a small bowl. Divide equally into the 12 cup muffin tin, pressing the mixture down into each muffin cup. Bake for 10 to 12 minutes (on middle oven rack) until light golden brown. Remove from oven and let cool. Meanwhile, lower the oven temperature to 325*F (170*C). In a food processor blend together the cream cheese and sugar until smooth. Add the sour cream, eggs and vanilla extract and process until the mixture is creamy. You will need to scrape down the sides a few times to get the mixture blended well. Divide the mixture equally over the prepared crust. Bake for about 25 minutes or just until the cheesecakes are firm to the touch. 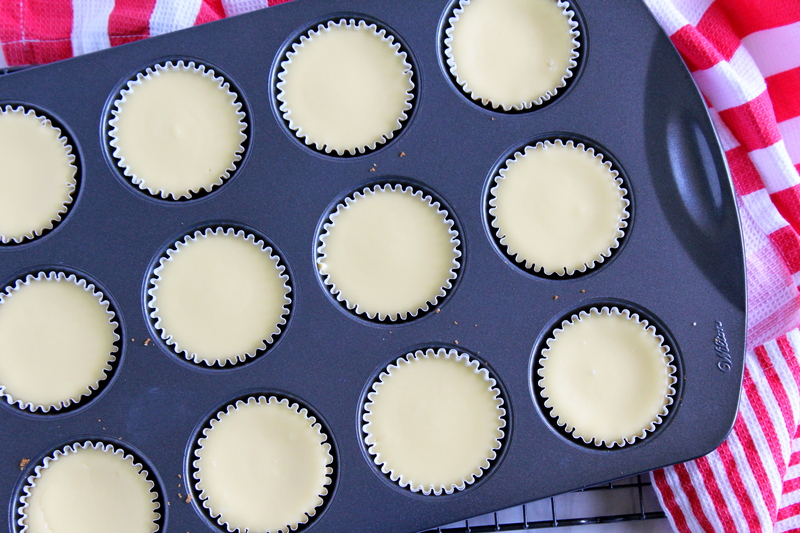 Do not over bake the mini cheesecakes. Let the cheesecakes cool and then refrigerate them for 4 hours or until they are well chilled. Top with strawberry, grapefruit mixture just before serving. In a medium size bowl, combine the sliced strawberries, grapefruit and sugar. Set the mixture aside for 5 minutes to macerate and then drain.